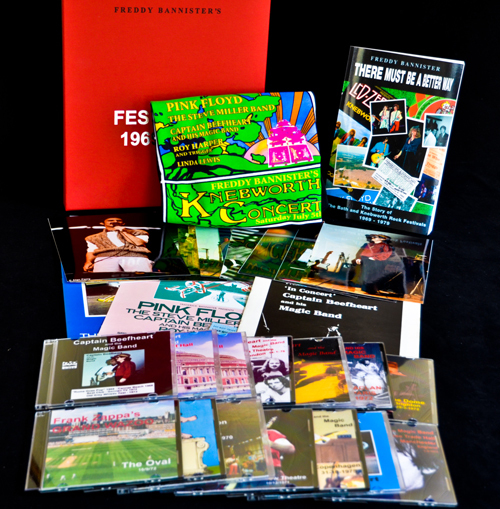 We have mentioned the Beefheart/Zappa Commemorative box set put together around Freddy Banister’s book “There Must Be A Better Way” a few times before, and its contents have been expanded recently again. The collection now also includes a CD of Frank Zappa’s Grand Wazoo at The Oval in 1972 and a Beefheart programme from the 1972 tour, making it a total of eight Beefheart CDs, four Zappa CDs, two DVDs, one book, one programme and assorted items of memorabilia …and the price remains £49.99. Don gave me an orange long sleeved t shirt at the Free Trade Hall Manchester cound check. I’ve still got it! Got the package a couple of days ago and I am delighted with all the stuff. t shirt, tickets fliers posters, photo’s dvd’s and bootleg cd’s and of course the book. I think it is great value for money and although I had to pay a lot to get it to Tasmania worth every penny. The quality of the recordings are very good compared to a lot of bootlegs I have and although some concerts are available else where, they are as I said better quality. The DVD’s are very interesting for me anyway, I love Pink Floyd and many of the other bands that appear in this collection. Only gripe is that the t shirt could be available in black and the presentation box is too bloomin big to fit anywhere unless face down. Small gripes for an excellent package. Had a chance now to read the book and found it a good read. Written simply, it is a record of a lot of Mr Banisters experiences over a couple of decades. He has some good stories with the bands although not a lot about Don, although this in no way distracts from the entertaining stories. A pleasant way to spend a day reading.